As summer hits its stride in Maine, there are some great events happening this weekend and we hope you’ll join us. We also have some exciting new beer offerings on the horizon here at Foundation. First, to answer the frequently asked question, yes, we will be able to increase production in the near future. Some of you already know we installed a third 30 barrel fermentation tank. We are happy to say that the first brew through the tank, a long overdue batch of Burnside, passed internal QC with flying colors. From the response in the tasting room this past weekend, you all agree! We are also looking to add two additional 45 barrel tanks in the coming weeks. We are very excited about this because it will allow us to produce some new beers we have been refining in the R&D Lab. Back to this weekend, we would love to invite you to join us and our good friends from points north, Orono Brewing Company, at The Thirsty Pig in Portland the evening of Friday the 24th at 7pm. Orono will be bringing their A-game, and so will we. As many of you know, we love to experiment with yeast and how it changes the dynamics of beer. We’ve been itching to try a variation of Epiphany fermented with brettanomyces. Crazy you say? Delusions of Grandeur?! Why yes, yes it is. Wanderlust, Burnside, and Epiphany will be flowing, as will Delusions of Grandeur. This will be a very limited release, so get to the Pig early if you want to have a chance to try it out. Friday night is covered, but what about Saturday? 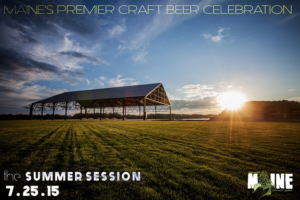 The place to be on July 25th is the Maine Brewers Guild Summer Session. If you are going to hit one brewfest this year, this is definitely the one. Not only is this your best chance to drink the most beer from Maine breweries, but we have also invited some of our friends from out of state to come and hang with us! We are excited to welcome Cambridge Brewing Company as our guest brewery at the festival. Check out the link for info on tickets and details about the many great breweries attending. In fact, it is going to be so awesome, we will be closing our tasting room for that Saturday so that the whole Foundation Brewing Company team can attend. For those of you who wanted to visit the brewery that day, we are sorry, and we encourage you to come to the festival. Trust us, it’s going to be a great time. Big party, on the water, with killer beer? Yes please!